Make everyone look at you with the Expression Colors of Coopervision lenses. Expressions Colors contact lenses is a brand of disposable, monthly replacement cosmetic contact lenses, manufactured by CooperVision. There is a wide range of six different colors, six different options: Blue, Dark Blue, Green, Aqua, Honey and Gray. The manufacture of these cheap color lenses is done with a technologically advanced coloring process, based on the combination of three colors and a definition ring. This process makes the change of color of your eyes is done in a completely natural and realistic, therefore, your eyes will not go unnoticed. The geometry of the lenses is aspherical, identical to the Biomedics 55 UV Evolution, a best seller of the Coopervision laboratory for its good adaptation and comfort. With these cheap lenses you can enjoy excellent vision and comfort that offers a correction for myopia (with powers up to -6.00 diopter) and hyperopia (with graduation up to +4.00 dp). Available without graduation. If you want to change the color of your eyes, it is advisable to go to a vision professional (even if your vision is perfect), since only professionals can assess how the lens adapts to the eye, avoiding possible problems arising from poor adaptation or a misuse of them. The maintenance of Expressions Color is very simple, you just have to use a single solution. Cleaning is simple, you should gently rub the surface of the contact lens and keep it in the case with the contact lens fluid. 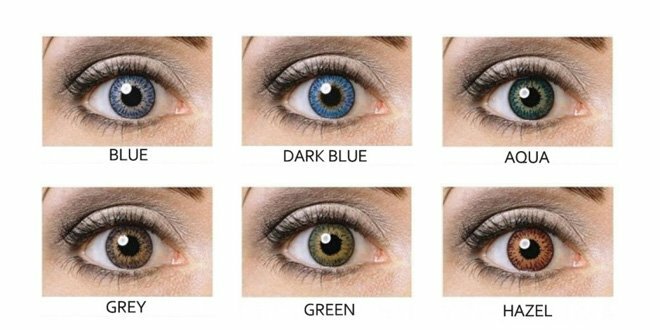 The presentation format of these contact lenses is especially good, they come from the factory in individual blisters (1 lens), so if you need them graduated and also, you have different graduation between one eye and another, you can order your contact lenses online from color with the necessary correction for only one month. In Prodevisión we have all the original brands. If you do not find your lenses among our brands, do not hesitate to contact us at the email address info@prodevision.com or phone 968 908 108, our contactologists will tell you the equivalent of your cheap lenses to the original brand , in this way, you will make sure that you are going to ask for the same ones that you usually use. In Prodevisión you can buy cheap Expressions Colors contact lenses quickly and with secure payment.